This restored former mansion is now an atmospheric retreat dedicated to rich Tamil Nadu culture. The name translates as 'one's own soul' and while here you can learn about the region's art, music and cuisine, enjoy healing pre-Ayuveda treatments in the Spa, take part in yoga classes. The hotel is owned by Krithika and Sumanth Subramainian, both architects, who have used their training to create a successful fusion of traditional and modern styles. There are 38 rooms arranged in the main building and a newly built wing. Carved wooden furniture, local artworks and colourful textiles add character. Rooms and suite vary in size, some with seating areas and verandas, and all with modern en-suite bathrooms with toiletries, flatscreen TV, and minibar. The hotel has 3 restaurants serving vegetarian cuisine typical of the area, using local organic ingredients, with one specialising in coffee and snacks. There are indoor and outdoor dining areas, and a lovely rooftop terrace and bar that is perfect for dinners based on favourite family recipes. The hotel has a library housing the owners' collection of historic books which guests are welcome to browse through, a number of sitting areas, courtyards and gardens. The spa offers a menu of treatments including massages and aromatherapy, and customised programmes are available. There are separate areas for yoga and meditation, and a gym with modern cardiovascular equipment. The hotel has an indoor swimming pool and jacuzzi. Activities revolve around demonstrations and classes. Performances of traditional music and dance, demonstrations of Thanjavur painting involving inlaid gemstones, bronze casting techniques and handloom weaving are complimented by cookery classes and training in chanting. The hotel arranges excursions to the city's famous historical temples, listed by UNESCO. Open: Svatma is open all year. Location: Svatma is in Thanjavur (formerly known as Tanjore) in Tamil Nadu, 1km from the railway station. The nearest airport is Trichy, 50kms away, about a 45-minute drive. Rooms: There are 38 rooms and suites in total, 7 of which are in the main heritage building, with the remainder in a new wing. They vary in size and layout, and are en-suite, decorated with local artworks and colourful throws and cushions. The 7 rooms in the main building have private verandas. Activities: The hotel offers classes in cooking and Vedic chanting plus demonstrations of bronze casting, handloom weaving, chamber and Carnatic music, traditional Thanjavur painting, and explanations of the distinctive Thanjavur style of dance. 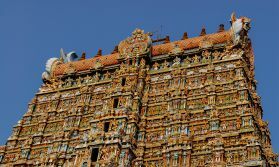 Sightseeing excursions to the city’s UNESCO-listed 11th and 12th century temples can be arranged. Other attractions include the palace and the Saraswati Mahal Library housing priceless Indian and European manuscripts. Facilities: The hotel has 3 restaurants and a large banquet hall. There are courtyards and gardens, indoor and outdoor sitting areas, a library with the owner’s book collection and travel reference books, a gallery that can be used for private groups, and a gift shop selling jewellery, art, handicrafts and antiques. Recreational facilities include the Soukyam spa with 4 treatment rooms, an indoor swimming pool, jacuzzi (adults only), and sound spa, and Arogyam, the gym and yoga centre. Dining: There are 3 restaurants: Aaharam, open all day and serving vegetarian dishes, Palaharam specialising in coffee and snacks and with indoor and outdoor areas, and Nila, a rooftop dining terrace. Children: Children of all ages are welcome, though the activities are not really suitable for young children. "The standard of the hotel facilities was very high but slightly let down by the limited english of the staff. Many were being trained and were working very hard but needed a few who had a better grasp of english."